Purchase Choco Caffeine Glow Combo for Dry Skin, SLS & Paraben Free worth Rs. 998 at Rs. 799 Only. 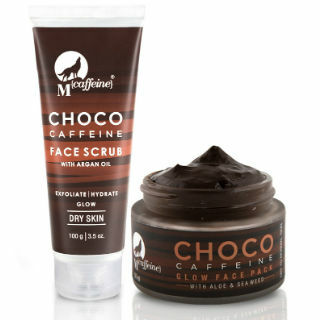 Indulge your skin in a two-step hydrating glow routine with MCaffeine Choco Range - handcrafted especially for dry skin. An unparalleled luxury skin care routine that not only exfoliates and adds glow but also hydrates your dry skin to give you a moisturized, soft and smooth skin. Dry skin is prone to damage and needs to be delicately nourished to remove the roughness, patchy skin, dead skin cells, and impurities.